One day in the early Seventies, I had a huge stroke of beginner’s luck. Going over to a friend’s house to borrow a book I was asked, over a cup of tea, if I would like to write a film. Just like that. 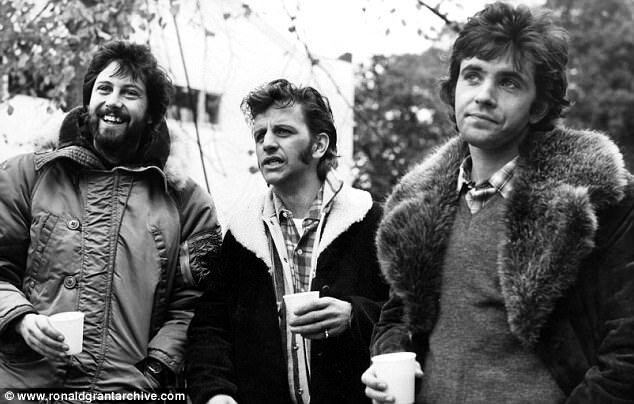 Things like that weren’t unusual in those days.The friend was David Puttnam who, after a successful career in advertising then as a photographers’ agent, had just become a film producer.He had an idea that he thought might suit me.Wild times: David Puttnam, Ringo Starr and David Essex. 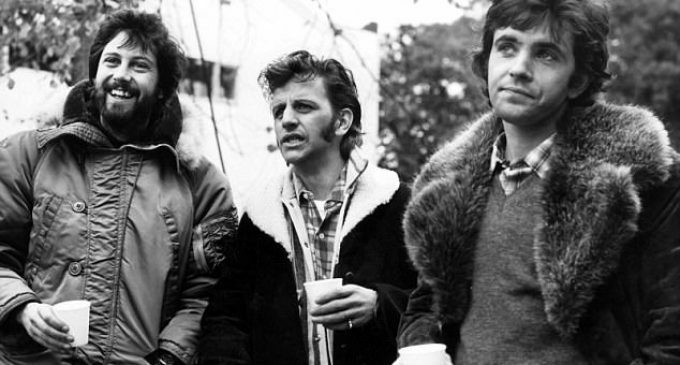 They are photographed in 1973+2Wild times: David Puttnam, Ringo Starr and David Essex. They are photographed in 1973I knew a bit about movies, absolutely nothing about writing a screenplay, but I agreed to have a go at it. So we talked and, by the time I went home that afternoon, not only had we sketched out a vague plot, we also had a title for our film.It would be called That’ll Be The Day, the inspiration for it came to David when he’d heard the Harry Nilsson song, 1941, which opens with the lyric: ‘Well, in 1941 a happy father had a son, And by 1944 the father walked right out the door…’I knew Harry Nilsson and I also knew that the song went on to tell how, when the son grows up, he runs away to join a circus.David, however, had another career suggestion for the boy. ‘What if in our story he joins a fair?’ That was it. We were off.Like Nilsson we were both in our early 30s and the film would be set in the late Fifties — our teenage years of rainy beaches, coffee bars and fairgrounds. Did I think it would ever get made? At that time, having no idea of the eye-of-a-needle chances of any film script reaching the screen, I probably did.RELATED ARTICLES Previous 1 2 Next Jay-Z ‘turns down offer to play the Super Bowl halftime… A boiled egg… for vegans: Veggie version that’s totally… Trump’s aides urged him NOT to insult Kim Jong-un at the…Share this articleShareIf David, who was in partnership with Sandy Lieberson, the producer of the Mick Jagger film Performance, had any serious doubts he kept them from me with his enthusiasm.What I didn’t anticipate was that when That’ll Be The Day came out it would be a huge hit, that it would make a star of a young stage actor of whom, when I’d begun writing, I’d never heard.Nor could I have imagined that it would co-star a Beatle and would lead to a No.1 album and a best-selling novelisation for me.At the time my day job was interviewing rock stars and anyone culturally cool for the London Evening Standard, so I would work on the screenplay late into the night. Then, a couple of times a week, David would come to my house for his breakfast to see what I’d come up with, scattering new ideas as he entered.Week by week we would then ransack our own lives as we created the fictional character of Jim Maclaine. After about three months I had a first draft of the script. Unfortunately, however, the Jim Maclaine character hardly did a decent thing in the entire story. He was the ultimate selfish teenager.The Who drummer Keith Moon straddled by a woman’s legsThe Who drummer Keith Moon straddled by a woman’s legsWe needed something to make him likeable.At which point David Puttnam took his family to see a stage production of Godspell in the West End. He phoned first thing the next morning.He’d found our boy. David Essex, the lead in Godspell, was so good looking and likeable an audience would forgive him anything.The next problem was that I’d written about working in a holiday camp but I’d never even been to one, let alone worked in one.Fortunately we knew two people who had — Ringo Starr, who’d been a drummer at a Butlin’s camp, and The Beatles’ former road manager, Neil Aspinall, who was now the managing director of their Apple records operation.So we went to see Ringo and Neil who were so entertaining with their Butlin’s memories that we offered Ringo the second lead in the film, as a friendly Liverpudlian Jack-the-lad.For his part, Neil agreed to help put together the band to play in our fictitious holiday camp — with Keith Moon on drums and Billy Fury doing the singing.We had a director by now in Claude Whatham and, as I rewrote and rewrote the script as is usual in film-making, everything was coming together very nicely.There was just one more problem — the perennial one in films. All the money wasn’t yet in place.Budgeted at a little over £200,000, it was hardly going to be an expensive movie to make, but in 1972 the British film industry was deep in the doldrums.Then a miracle occurred. Puttnam went to see a small Canadian television marketing company and proposed building our movie around a plethora of old hits they could promote as a tele-marketed compilation album.They would pump more than £200,000 into an advertising campaign, showing clips from the film, so all we had to do was put together a 40-track soundtrack album of oldies but goldies.We’d always planned to have some songs in the film, but 40!Quickly, I began another draft of the script.